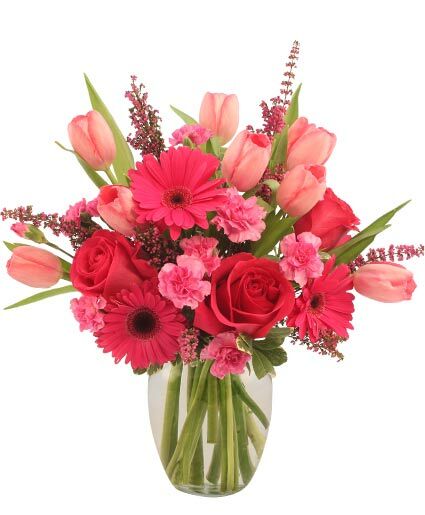 Ginger Vase, Foliage: Variegated Pittosporum, Hot Pink Roses, Pink Tulips, Hot Pink Gerberas, Pink Miniature Carnations, Fuchsia Heather. Tall Cylinder Vase, Cream Colored Hydrangea, Dark Blue Hybrid Delphinium, Green Hanging Amaranthus. This tall vase of flowers is as elegant as it is simplistic. 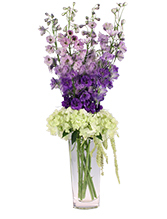 Blue hybrid delphinium, cream colored hydrangea, and green hanging amaranthus are a fountain of violet color. 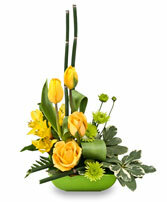 Call to order this great arrangement today! 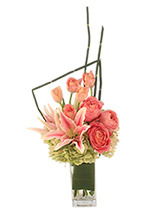 Tall Square Vase, Foliage: Aspidistra, Hydrangea (Antique Green), Blush Pink Tulips, Hot Pink Lilies (Sorbonne), Dark Pink Garden Roses, Equisetum (Horsetail). Square Limegreen Design Dish, Wet Floral Foam, Foliage: Galax, Leather Leaf, Variegated Pittosporum, Yellow Roses, Yellow Alstroemeria, Yellow Tulips, Limegreen Button Poms, Equisetum (Horsetail). Show your Appreciation with Flowers from Prairie Flowers & Gifts. It's a Great Way to Honor Someone that Inspires and Motivates You to Be the BEST! All orders placed by noon, central time, are available for same day delivery. No deliveries when we are closed, except for funerals. During Holidays, I may be open longer than hours listed. Please call the shop 608-588-9999 and see if I'm open!